As early as 2,700 years ago, the small harbour town of ‘Kamara’ was situated here, part of the ancient city state of Lato. Agios Nikolaos is a peaceful little town on a range of hills. The coastline is long with many contours; a small inner lake connected to the sea serves as a harbour for fishing boats. The development of Crete as a holiday island began in Agios Nikolaos, around 1960. The fast-paced and humorous book ‘Winds of Crete’ tells the tale very nicely (incidentally, the second part then takes place in Georgioupolis). You can buy it in Cretan bookstores. Apart from being a holiday resort, Agios Nikolaos is especially important as the administrative centre for all of eastern Crete. From Georgioupolis, you can best reach the town, under the protection of its patron, Saint Nicholas, by rental car. With the public bus you would have to change in Iraklio, and it would take 3-4 hours to get to Agios Nikolaos. By car, you can travel the 165 km along the north coast on well-developed national roads, which even resemble motorways in part, and you will also find lovely rest areas and plenty of petrol stations. You can expect 2.5 hours of actual journey time. 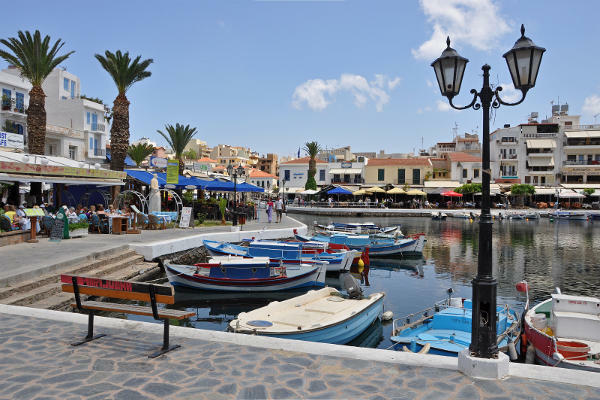 Apart from being a holiday resort, Agios Nikolaos is especially important as the administrative centre for all of eastern Crete. This gives the little town a great deal of authenticity, despite all the foreigners. There is no old town, because in its current form, this place is still young. Nevertheless, it still boasts a long history. As early as 2,700 years ago, the small harbour town of ‘Kamara’ was situated here, part of the ancient city state of Lato. A small settlement flourished here in Byzantine times; in the 13th century, Genoese crusaders and merchants built a castle on one of the hills. We recommend that you park your rental car in Agios on the paid parking lot by the marina, which is clearly signposted. From there, you can follow the coast road, past the small town beach, Kitroplatia, circumnavigating the whole peninsula, on which parts of the town are built. You’ll be at the ferry terminal in 10 minutes, and then straight onto the little bridge, which spans the channel between the inner lake and the sea. Here, you’ll definitely want to make yourself comfortable in one of the many cafés right by the shore. After a breather, cross the bridge and you will find yourself right in front of the tourist information office. Here you should inquire whether the town Archeological Museum has already reopened (planned for no earlier than autumn 2016). If so, head uphill about 400 m on Odos Konstantinou Paleologou street, which leads off from the bridge. The most valuable treasure within the Archaeological Museum is the 'Venus of Myrtos' from the early Minoan period. It is an ornate ceramic vessel in the form of a stylized female deity. The bell-shaped body with implied breasts and a pubic triangle merges into a long, phallic-shaped neck, with a small head sitting on top. The deity holds a small pitcher in her thin arms. The small Folk Art Museum right next to the tourist information office should definitely be open (Tue - Sun, 10 am - 2 pm). There you will see traditional Cretan costumes, elaborate embroidery, woven pieces, old icons and much more, on display in a single room. Now go back over the bridge and take the first right into the pedestrian zone, Odos 28is Oktovriou. You are now in one of the town’s two main shopping streets, running parallel to one other with many nice shops. You will come to Platia Venizelou Square and to your left you will already see Agia Triada church, dedicated to the Holy Trinity. It is open all day long. The interior is entirely decorated with large paintings in the traditional Byzantine style. Time for lunch: Taverna Itanos welcomes you in Odos Kiprou street, just 20 m from the church. It offers Cretan cuisine at reasonable prices. You don’t need to choose from the menu here; instead you can select what you want to eat from the hot bar, or sometimes even directly from the kitchen. Many locals also dine here. Drive out of the parking lot around the Peninsula, cross the bridge and stay on the coast road. After about 15 minutes you will arrive at the small harbour of Elounda. Boat trips leave approx. every 30 minutes from here to the island of Spinalonga. The small island has an extensive Venetian castle with well-preserved outer walls. But that’s not why most visitors come here. They are intrigued by Spinalonga’s reputation as the last leper colony in Crete. From 1903 to 1954 all the lepers on Crete were exiled here. Those infected moved into empty houses, planted gardens, improved the water supply, and even opened tavernas. Occasionally, a priest and a doctor came to the island for their spiritual and physical wellbeing. Those infected entered into marriage, had children, they even formed a theatre group at times and printed their own newspaper. There's hardly anything left to see of all this, but the idea of what once happened here still causes visitors to shudder. On your return, you can head 150 m to the right from the jetty and you will be right on a sandy beach, where you can take a late afternoon dip before heading home. Drive back to the national road, and take the turn-off to Kritsa. Before you reach the mountain village, a sign draws attention to St. Mary's Church. Even if it is already closed, the short walk to it is still well worth it, because this ancient place of worship is idyllically situated amid natural surroundings. When it’s open, you will see faded wall paintings from the 13th-15th centuries inside. Once you’ve walked to the church, continue to drive up to Kritsa, and leave your car in front of the historic village centre. Here, you can wander through the alleyways of this old town. You’re unlikely to be alone, however, because Kritsa has already achieved international fame as the location of the 1956 film 'He Who Must Die', a fame that it lives off to this day. Kritsa is a great place to have a coffee and enjoy some cake before returning to Georgioupolis.